This tour will take you to the birthplace of the Sakyamuni Buddha, Siddhartha Gautam, born in 563BC on the full-moon-night, in the forest of Kapilvastu. The Kapilvastu district is located in the plains of South-West of Nepal. The site is accommodated by master plan territory within which Monasteries, Viharas, and Chaityas have been built representing the different Buddhist nations of the world. The temples of devotion are given a tranquil atmosphere by the surrounding woods, ponds and swamps. Maya Devi temple is built shading the spot where child Sidhhartha first stood as he alighted in the world. One finds it very soothing to cycle within the territory visiting monasteries and temples. There are quiet spots under the trees where one can meditate without any external disturbances. Visitors can also enjoy birding in the woods, ponds and swamps. The area accommodates some of the rarest species of birds like Sarus Crane. This site is of archeological interest, too. Visitors can extend or shorten the trip as per their holiday plan, for the site offers some interesting cultural walk in the local village of the plains. 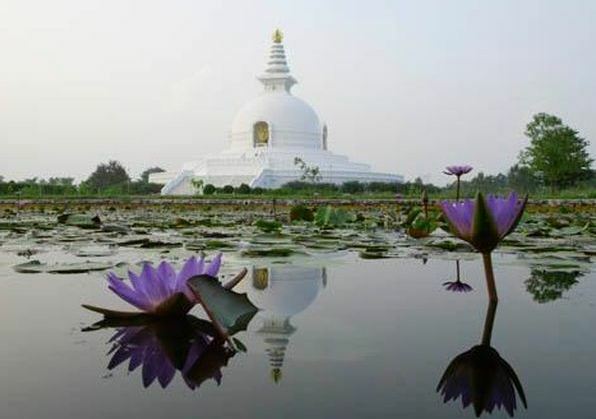 The Lumbini is for all seasons, yet from October till May are the best months to visit. We take group as well as individual booking in this tour. One can drive to the site or take a flight to Bhairahawa and drive. We have more cultural and spiritual sites in Nepal. Please, tell us your priorities we tailor ten trip itinerary for you! Mount Kailash Himal stands in the western region of Chinese province of occupied Tibet, in Asia. It is the Gateway to Nirvana not only for the religious people but also for the Alpine adventurers, for this is the land of Divine Madman Drukpa Kunley and it is called the Roof of the World. Mount Kailash, which is believed to have been formed 30 million years ago when Himalayas were in their early stage of formation, is one of the most revered places in the Himalayas. Spread out on the Tibetan plateau, beside Mount Kailash is the giant lake of shifting colours - Lake Mansarovar. It is believed that Brahma, the creator, had a mind ('Man') for the creation of a lake ('Sarovar'), hence its name. A pilgrimage to Mount Kailash and a bath in the Manasarovar is believed to bring about salvation (Moksha) for those who are stumbling at the Gate of Salvation because of their corrupt KARMAS. For Hindu conservatives it is more like ticket to salvation, just as the ticket that were sold in the Middle Age by the Pope in Christianity. The circumference of Mansarovar is 88-km, its depth is 90m and total area is 320-sq-kms. The lake freezes in the winters and melts only in spring. It looks unbelievably fascinating on moonlit nights when an ethereal ambience pervades the atmosphere. The circumference of Rakshas Tal, also known as "Ravan Kund", is 122-km. A 6-km long natural channel - "Gangachhu" - connects Manas with Rakshas Tal. KATHMANDU(1300m). O/NT Hotel Tibet or Similar: The Group shall be met at the airport and transfer provided to Hotel Shanker or similar. Time Permitting, a pre-departure team meeting shall be held in the evening. AM:Visit The Pashupatinath temple and temple of sleeping Vishnu- Budhanilakantha. PM:The Group is free for final preparation of the Kailsh Kora Yatra. KATHMANDU-NYALAM(3750m)153Kms. 6-7 Hrs. O/NT AT HOTEL NYALAM Or SIMILAR. Embark on a scenic drive from kathmandu to Kodari. Walk to the Friendship Bridge and drive uphill to Zhangmu. After completing custom and immigraton formalities, proceed to Nyalam. NYALAM (3750m). O/NT AT HOTEL NYALAM OR SIMILAR.Stay at Nyalam for acclimatization. 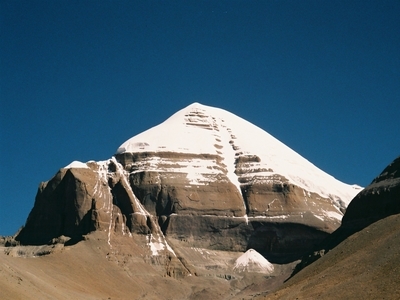 The Group will be taken for a 3 hrs Trek to further prepare for the Holy Kailas Parikarma. NYALAM-SAGA(4600m) 240 Kms./6-7 Hrs. O/NT AT HOTEL SAGA. Drive to Saga via Paigu-tso Lake. SAGA-Paryang(4750m) 255 Kms./5-6h Hrs. O/NT AT HOTEL PARYANG. PARYANG-MANASAROVAR(4560m) 223 Kms /5-6 Hrs. O/NT AT GUESTHOUSE. 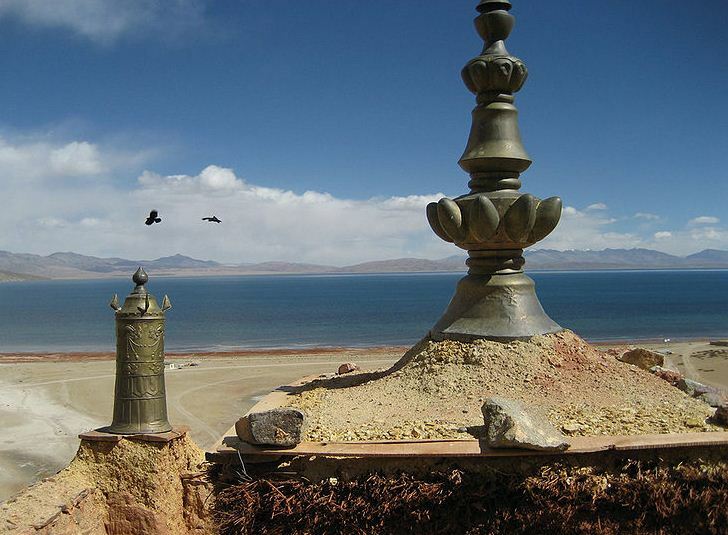 Drive to Chui-Gompa with the Circumbulation of Lake Manasarovar. MANASAROVAR-DARCHEN (4620) 115 Kms. 4-5 Hrs.O/NT AT GUESTHOUSE. AM: Puja at the Lake. The Group is free to explore the Lake MANASORVAR or Visit The Hot Spring on own. PM: Drive to Darchen(4620m). O/NT at GUESTHOUSE. Drive to Serlung monastery and to Asthpath for an excellent view of Nandi Parbat and Holy Mount Kailas. The Group will stay at Darchen and make final prepartion for the Kailas Kora. DARCHEN-DIRAPUK(4860m) 20 Kms. 5-6 Hrs. GUESTHOUSE. Drive ahead of Tarboche to the trek starting point of Kailas Parikarma(13 Kms). Trek to Dirapuk (7 kms). CAMP/GUESTHOUSE. DIRAPUK-ZUTHUL PUK (4760m) 18 Kms. 9-10 Hrs. GUESTHOUSE. Trek to Zuthul PUK crossing the Dolma la Pass (5650m) visiting Gauri Kunda. NEW FIXED CAMPING. ZUTHUK PUK-PARYANG (4750m) 280 Kms. 10-11 Hrs. O/NT AT HOTEL PARYANG. End Kailas Parikarma (10 Kms) approx 3-4 Hrs Trek and drive 270 Kms. to Paryang. PARYANG-SAGA (4600m) 255 kms. 6-7 Hrs. O/NT AT HOTEL SAGA. SAGA-NYALAM(2300m) 270 Kms.7-8 Hrs. O/NT at GUESTHOUSE. NYALAM-KATHMANDU(1300m) 123 Kms. 7-8 Hrs. O/NT HOTEL SHANKER. Drive downhill to Zhangmu and Frienship Bridge where transportation awaits for the final leg of journey to Kathmandu. The day is free untill your transfer to the airport for onward journey. Relax - do not exert; Do not get over excited. Walk slowly - adopt one third of your normal speed. Whenever you feel uncomfortable just stop: rest and relax. Ignore the sudden outburst of fellow pilgrims and avoid arguments. Observe silence with a smile. Remember - never go too high too fast. Avoid smoking and alcohol - drugs or intoxicants. Consume plenty of liquid (three liters per day); never proceed with an empty stomach.